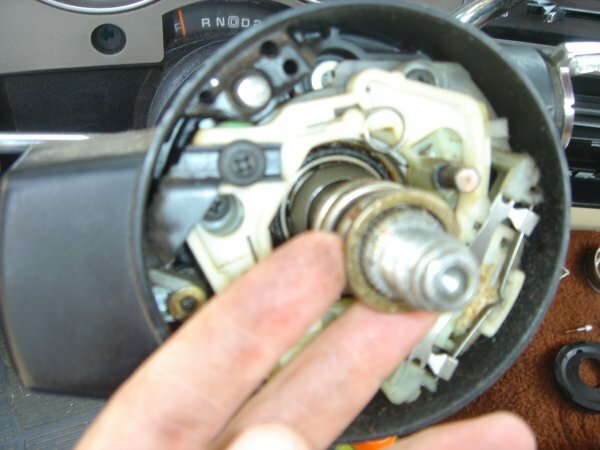 Steering column lock plate help. SO working on the steering column I had to remove the lock plate. Everything went well with my repair, I have the turn signal switch installed but I can not for the life of me get the lock plate spring pushed down far enough to slip in that little ring. I believe the part I am having trouble with is the top bearing inner race. Here is a link to how this looks exactly on my car. AS soon as i took off the spring that pushes the lock plate I noticed this race was just loosely sitting and the steering column just wobbles around. What am I doing wrong? I did this in this order. I just moved the top bearing inner race as far back as it will go (it still just wobbles around with the steering column). then I put the spring in so that it touches the race. finally I place in the lock plate and compress it with the lock plate tool. However it simply will not compress enough for me to slip in the ring and lock it in place. Any tops would be helpfull. Am i doing something wrong ? Is there some part of the bearing that should go in before this race? The spring sits on this race but I cant compress it enough. Like i cant get it aligned properly or something. Did quite a few mostly for lock cylinder (keys lost) and understand the fussy little ring but not problems you are having now. I suspect something in how the tilt function of shaft went wrong or was wrong. Never had to fight with one so really can't expound on fix or find whole column! Did steering wheel come off without a fight? Not quite sure but might try putting steering wheel back on and snug up even without the plate to set the shaft back as it seems something went wrong. Yes - getting that little ring out and back is tight and fussy even with the right tools. Something isn't adding up to me just yet with this.